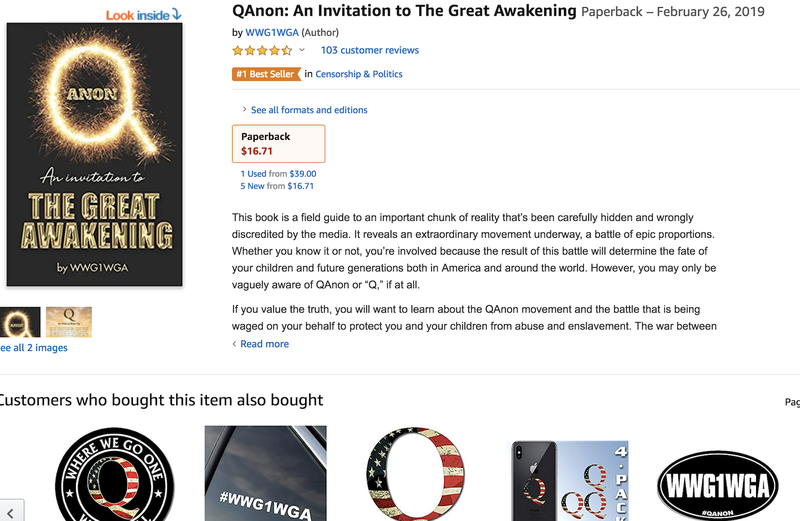 A book pushing QAnon's pro-Trump conspiracy is currently ranked number one on Amazon's top selling books about censorship and politics, NBC News found. The book has also ranked 12th on the site's hot new releases book chart, and is the 44th best seller overall. Among a series of bizarre claims, the book alleges that Democrats murder and eat children, and the federal government engineers diseases and global epidemics. Social media and content sharing platforms have come under pressure in recent months over the spread of conspiracy theories on their platforms. A new book promoting a bizarre pro-Trump conspiracy theory alleging that Democrats murder children and the government engineers diseases has soared up the Amazon's sales charts, NBC News reported Monday. 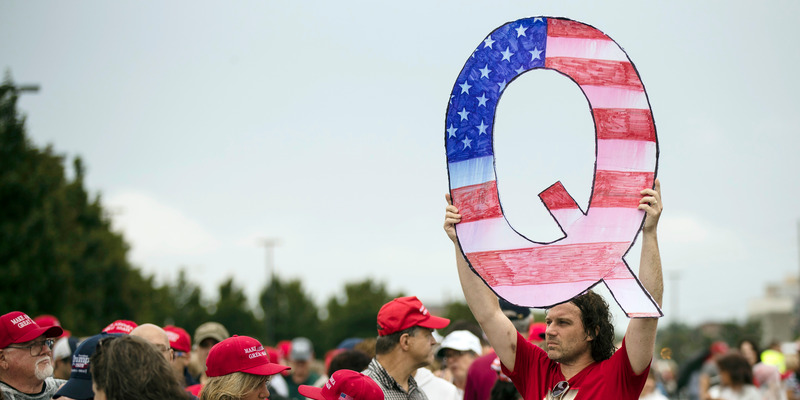 "QAnon: An Invitation to the Great Awakening" is listed as the number one bestseller on the site under the Censorship and Politics category, beating back classics including Ray Bradbury's "Fahrenheit 451," William Golding's "Lord of the Flies," and Margaret Atwood's "The Handmaid's Tale," which lie in second, third, and fourth place respectively. As of early Tuesday, the book is also listed at number 44 in Amazon's overall bestseller chart, and at number 20 in the Politics and Social Sciences list. Sales of the book have also propelled it to number 12 in the list of hot new releases, which is generated algorithmically and pushed to shoppers browsing the site. The book's author or authors go under the name WWG1WGA, apparently a reference to the QAnon adherent's slogan: "Where We Go One We Go All." They claim in the description of the title that the book "reveals an extraordinary movement underway, a battle of epic proportions." "Whether you know it or not, you're involved because the result of this battle will determine the fate of your children and future generations both in America and around the world," they add. According to NBC, the book contains a series of outlandish and unsubstantiated claims, including that Democrats murder and eat children, and that the US government engineered the AIDS virus and a series of natural disasters. Amazon also suggests a range of QAnon-related products for those who click to view the book title, including stickers, cellphone covers, and baseball caps. Amazon did not immediately respond to a request for comment. The site refused to answer questions from NBC about its placement of the title on its algorithmic recommendations charts. An evidence photo shows a handgun in the trial of Edgar Welch, 29, of Salisbury, North Carolina, who wielded an assault rifle inside the Comet Ping Pong pizzeria after a fake online "Pizzagate" report that it was a cover for a child abuse ring in Washington, D.C., U.S. on December 4, 2016, in this image released on June 22, 2017. Courtesy U.S. Attorney's Office for the District of Columbia/Handout via REUTERS ATTENTION EDITORS - THIS IMAGE WAS PROVIDED BY A THIRD PARTY. An evidence photo shows an assault rifle in the trial of Edgar Welch, 29, of Salisbury, North Carolina, who wielded an assault rifle inside the Comet Ping Pong pizzeria after a fake online "Pizzagate" report that it was a cover for a child abuse ring in Washington, D.C., U.S. on December 4, 2016, in this image released on June 22, 2017.Courtesy U.S. Attorney's Office for the District of Columbia/Handout via REUTERS ATTENTION EDITORS - THIS IMAGE WAS PROVIDED BY A THIRD PARTY. An evidence photo shows an assault rifle in the trial of Edgar Welch, 29, of Salisbury, North Carolina, who wielded an assault rifle inside the Comet Ping Pong pizzeria after a fake online "Pizzagate" report that it was a cover for a child abuse ring in Washington, D.C., U.S. on December 4, 2016, in this image released on June 22, 2017. Courtesy U.S. Attorney's Office for the District of Columbia/Handout via REUTERS ATTENTION EDITORS - THIS IMAGE WAS PROVIDED BY A THIRD PARTY. The QAnon conspiracy theory emerged on the anonymous 4Chan postings board in late 2017, when a poster going under the name "Q" and claiming to be a top government official started to leave a trail of cryptic messages that quickly drew a large and obsessive following. Followers claimed that the clues exposed an elaborate conspiracy involving top Democrats and Hollywood stars running human trafficking networks. According to the adherents, President Donald Trump and allies in the military are poised to take down the network. 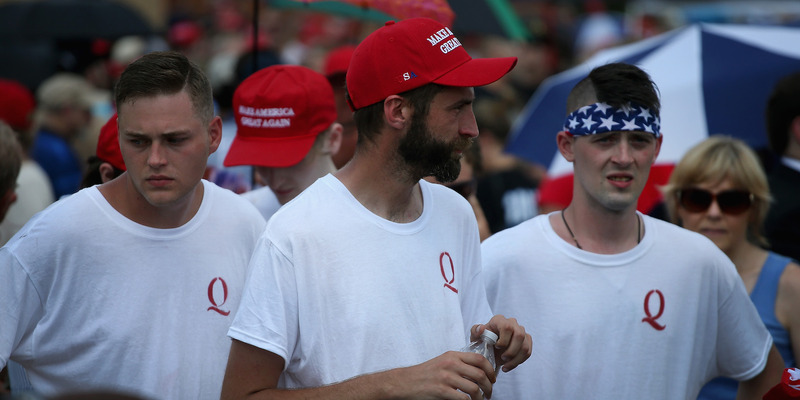 In summer 2018 adherents of the theory began attending the president's rallies, wearing clothing and carrying banners emblazoned with QAnon slogans. The theory has allegedly inspired some to commit crimes — with a man arrested near Arizona's Hoover dam in June in a self-made armoured car carrying several firearms and claiming to be guided by "Q," according to police. Another man arrested in May for refusing to leave an abandoned Tucson cement plant, who was convinced he was being used as a trafficking hub, was also allegedly inspired by the movement, prosecutors said. Social media companies have faced questions from lawmakers in recent months about the spread of conspiracy theories on their platforms, with Democratic Rep. Adam Schiff warning in a letter to Facebook and Google in February of the danger of allowing anti-vaccination conspiracies to be propogated on the site. Google-owned YouTube announced last month that it would ban advertising on channels that ran anti-vaccination videos so posters could not monetize the content. 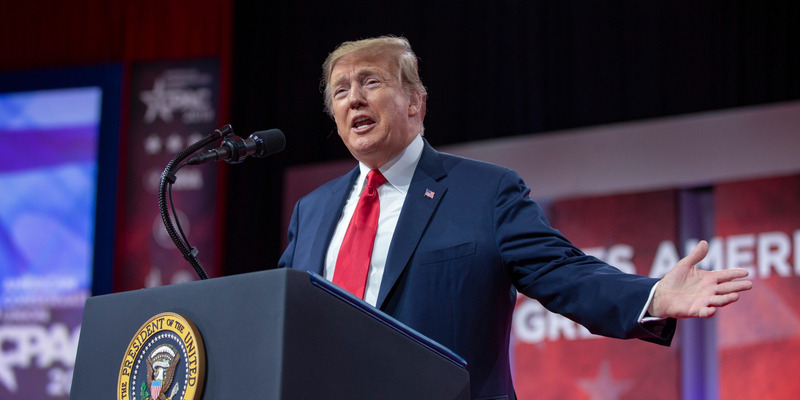 Jason Kint, CEO of the trade association Digital Content Next, told NBC News that those pushing fringe political material on Amazon were able to game the site's algorithms, with devotees flooding to buy products soon after their release and flooding comment boxes with adulatory reviews. "To be clear, they absolutely shouldn't be censoring the availability of books like this," Kint said. "But the fact we're left only with the publisher's own description of the book and a clearly gamed set of 5-star reviews — how is the average shopper supposed to know this is toxic garbage?"